Toorloo Arm has beautiful new building which forms the hub of the school. 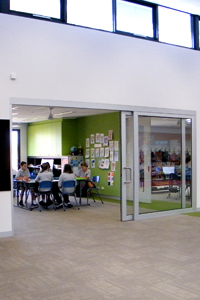 This building is fitted with the technology required for students to develop proficiency in the use and application of Learning Technologies for the 21st century. The school site is 1.2 hectares in area (3 acres approx). Our school has entered a new and exciting phase with the building of a completely new facility in 2012. Over 3.85 million dollars has been spent building a state of the art educational complex. This complex integrates classrooms, library, shared spaces and administration under the one roof. A new outdoor sporting area and classrooms will be built later in 2013. Click here to see images of our school grounds & facilities. Computers, electronic whiteboards and other digital technologies are used to support student learning in all areas. The school is transitioning from set desktop configurations to laptops which provide more versatility with students being able to use them in any location. Click here to open the web gallery. The gallery will open in a new window. Click on any image to see it enlarged. Click the word "index" above the enlarged image to return to the page of thumbnails.